This is the perfect time of year to start thinking about what students need to work on during the second half of the school year. 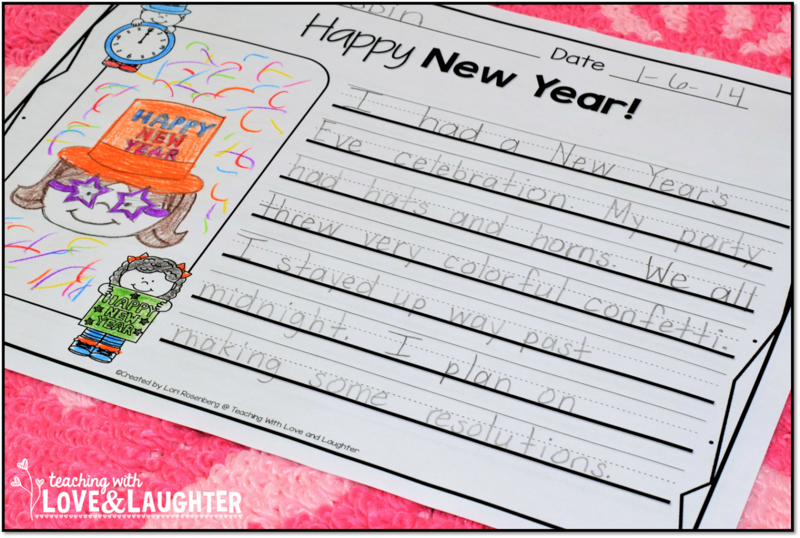 This is usually the time I like to work harder on writing instruction because the children have learned how to spell so many new words and they are way more confident than when the school year began. Some children still need practice writing words, some need help writing sentences, and some are well on their way to becoming budding writers. 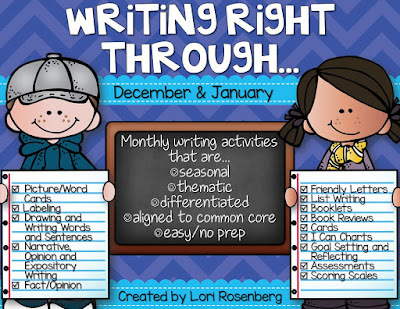 Many of them are at different places in their writing, and it's a good idea to arm yourself with activities that will accommodate all of your learners. 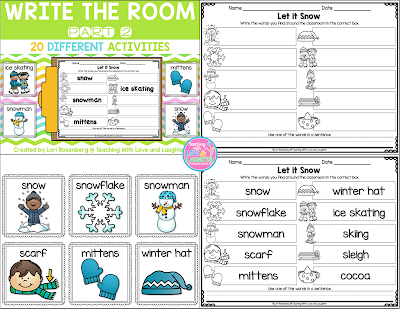 Write the Room is always a favorite in my class. It gets the children up and moving around and they love to find where I've hidden the words. 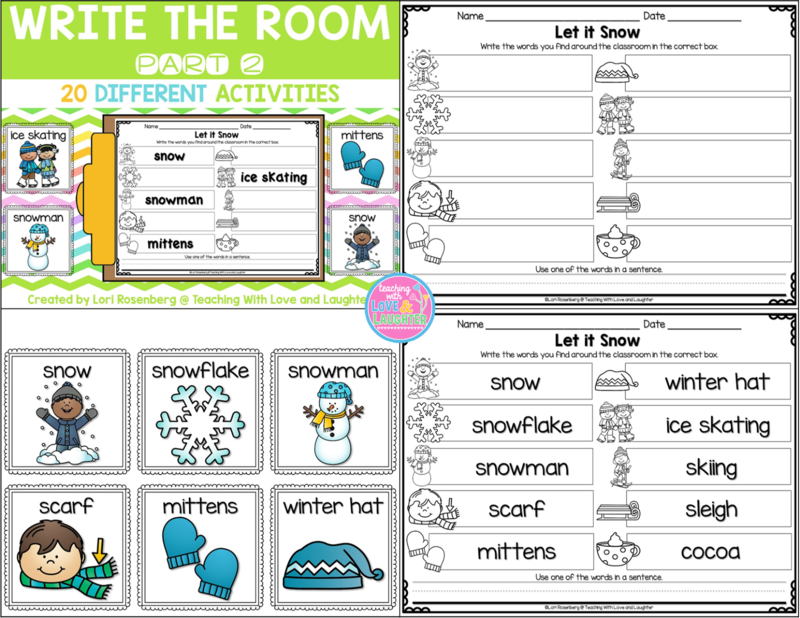 Write the Room is great for reading, spelling, writing, and increasing vocabulary. 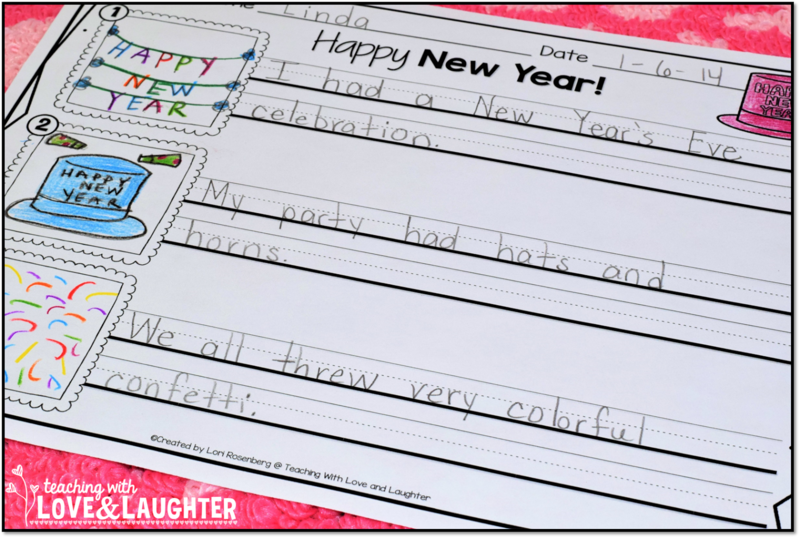 I love when I see the children using the write the room picture/word cards in their daily journal writing. Sentence puzzles are a wonderful activity to help young learners practice reading, writing, spelling, conventions, and grammar. 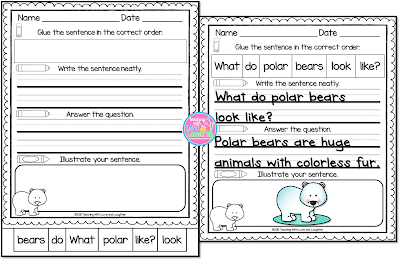 Many of my sentence puzzles are fact based, making for even more meaningful learning! Here's an example of version 1. 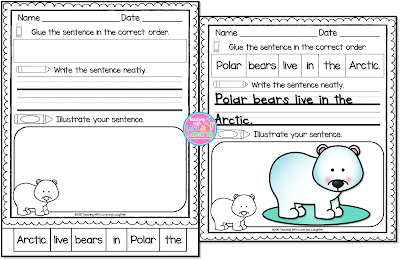 Students put the sentence in order and copy it neatly. Here's an example of version 2. 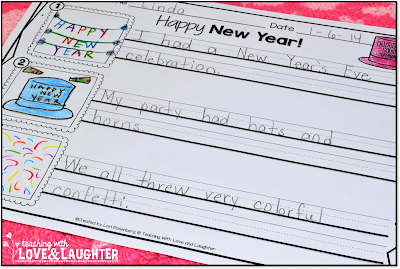 Students put the sentence in order, copy it neatly, and write an answer to the question. 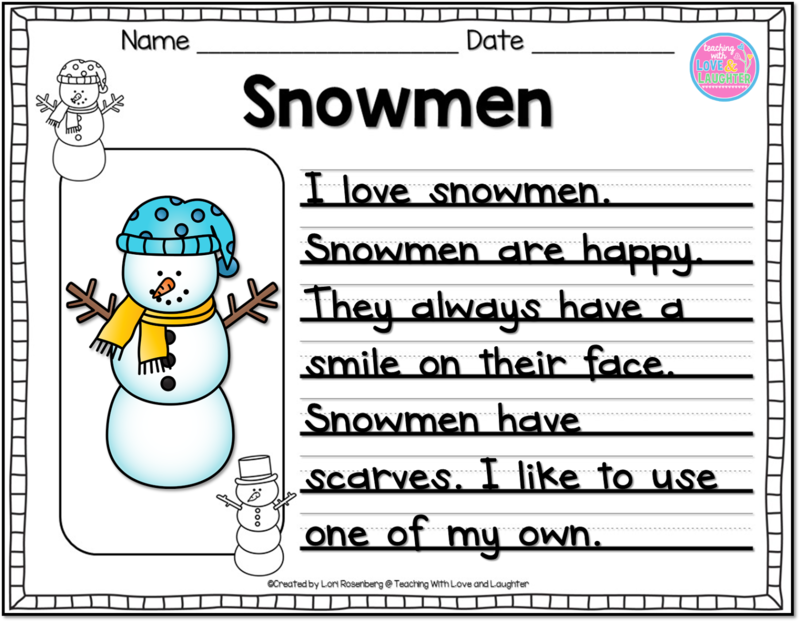 Scrambled sentences give the children lots of practice writing proper sentences and writing neatly. 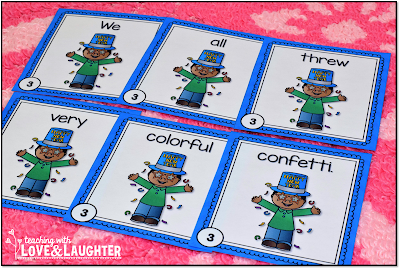 First, the children unscramble the sentences. Each pack includes six different sentences. 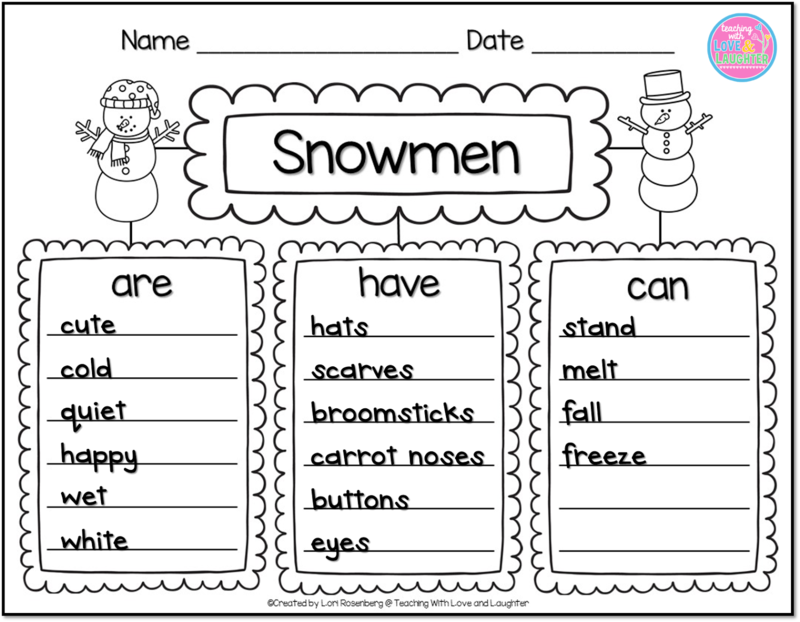 Then, there are a few different ways for the children to record the sentences. They can write them on a recording sheet. Three sentences and pictures on the front and three on the back. 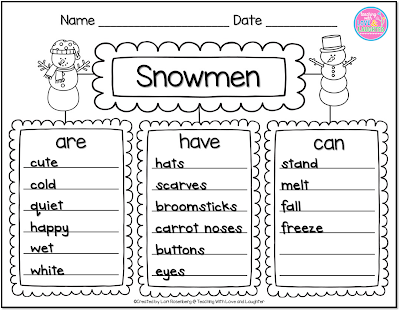 Or, they can write them on lined paper, making a well organized paragraph. 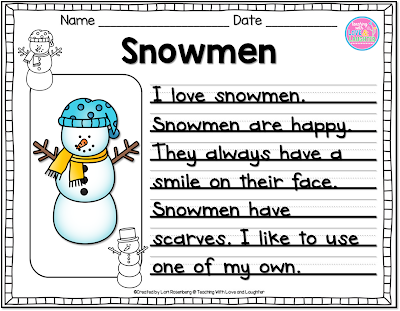 And, the last way they could write the sentences, is in a six page booklet. 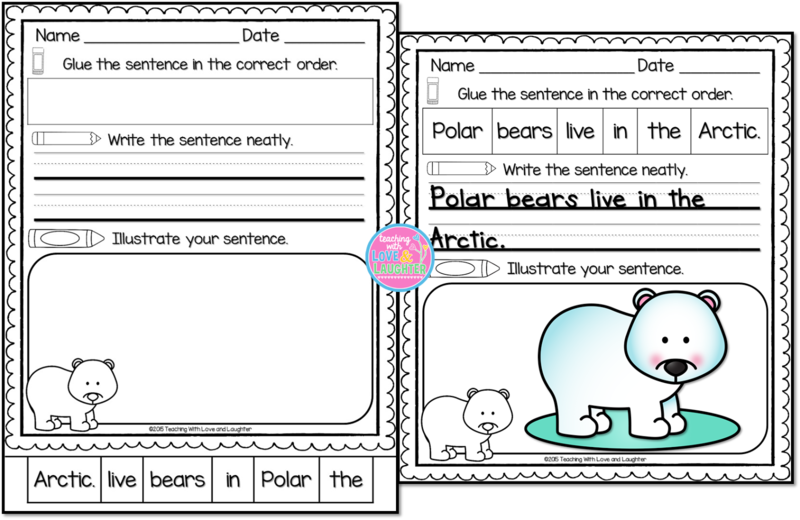 They write one sentence on each page, drawing a picture to match. 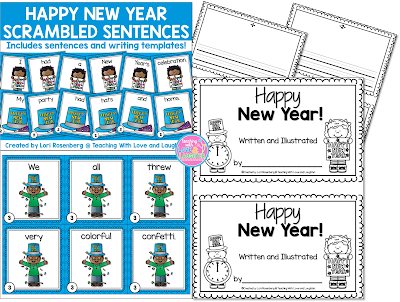 Click here to see scrambled sentences for the rest of the winter. Students will love Writing Through the Winter and so will you! 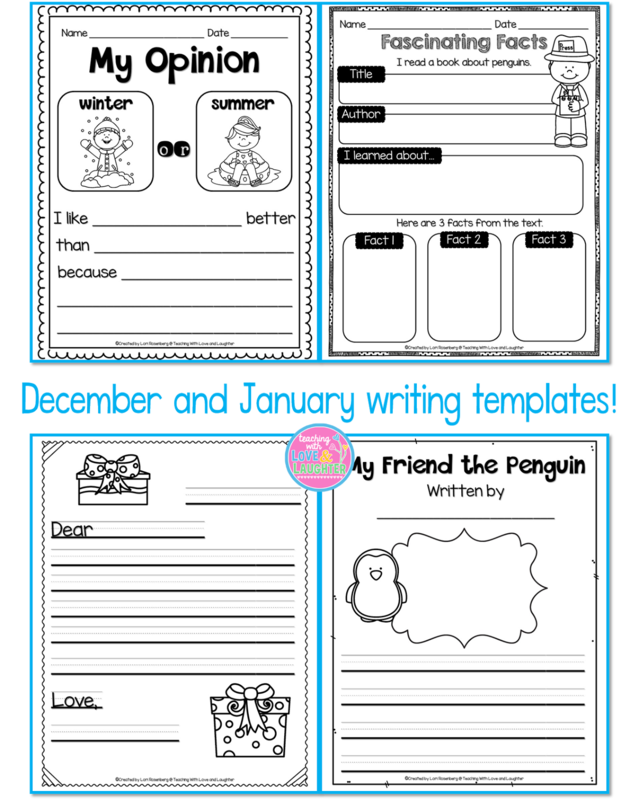 Writing Through the Winter is a fun and easy way to teach children how to write well organized paragraphs about winter topics. First, the children brainstorm on the topic. Then, they choose one idea from each column to write about and copy it onto their writing web. There are three different versions of the web. The one you see here contains a lot of support. The other two versions contain less support for more experienced and confident writers. And, finally, they copy the information from their web onto the final writing template, making a well organized paragraph. More experienced writers can add more details to their writing. 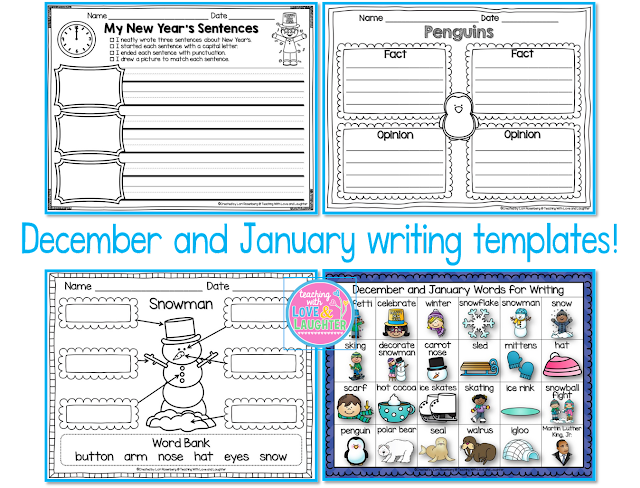 Once you model a few of these, you will see your students writing well organized paragraphs on their own. 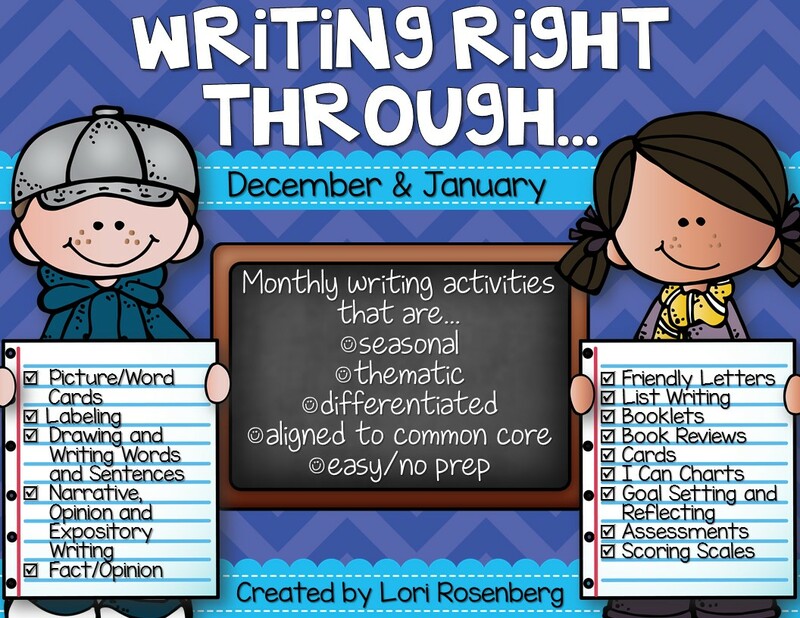 Writing Right Through December and January is part of a series of seasonal and theme related writing activities for each month of the year. 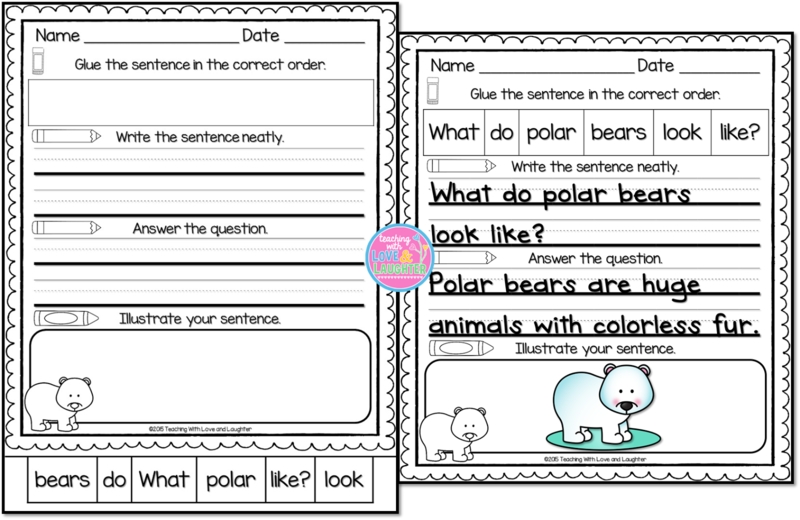 All of the activities are differentiated and contain the right amount of support for developing writers to be successful. 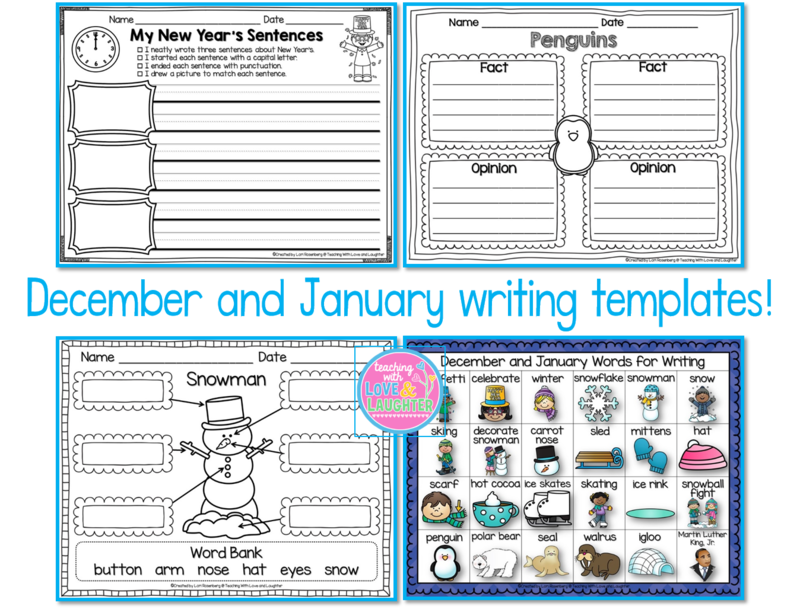 I wrote a VERY detailed blog post, here, about how I set up all my Writing Right Through...templates. I LOVE this series, because I never have to worry about what I'm going to put at my Work on Writing Station. And, since they cover all the common core writing standards, I'm good to go for the entire school year. The last writing activity I want to show you is Rebus Writing. Talk about fun! Students write stories using a combination of pictures and words. 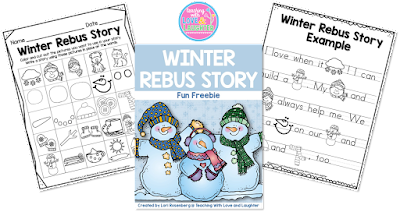 Here is a FREE Winter Rebus Story for you to try. 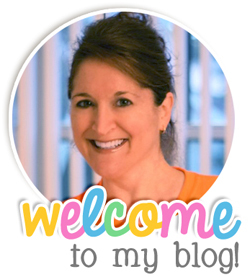 Here are links to all the activities mentioned in this blog post. Awww! Thanks so much Jen!